FORT PIERCE — Standing at the Islamic Center of Fort Pierce on Thursday where investigators said an arson fire ravaged part of the facility, a longtime worshiper vowed the plan is to rebuild. A day earlier, St. Lucie County sheriff’s investigators arrested Joseph Michael Schreiber, 32, of the 5700 block of Northwest Zenith Drive in Port St. Lucie, in connection with the fire. The blaze, which started around midnight Sunday, conservatively is estimated to have caused more than $100,000 in damage to the Islamic center on West Midway Road, according to an arrest affidavit. Nefzi, who said he’s been a member for about 10 years, said it’s good for the community that Schreiber is behind bars. “What he did here he can't do to anybody else,” he said. Schreiber was arrested on two felony charges, arson, and evidencing prejudice while committing offenses, which is the state’s hate crime enhancement. Hisarrest affidavit contains few details of the evidence against him. Schreiber was held Thursday in the St. Lucie County Jail without bond, a jail official said. Federal officials, including the FBI and the Department of Justice, said they will continue to investigate the fire for potential violations of federal law. He told investigators he didn’t mean to hurt anyone “and was embarrassed for having committed the crime,” an arrest affidavit said. The mosque is where Omar Mateen had worshiped. Mateen is the gunman from Fort Pierce who went on a shooting spree June 12 at an Orlando gay nightclub that left 49 dead. Much of Schreiber’s arrest affidavit describes what is depicted on surveillance video from the mosque, which shows a person approaching on a motorcycle, talking on a cellphone and running from the building as a large flash of light is seen. The fire happened not long after people left the mosque after breaking a voluntary fast, said Wilfredo Ruiz, mosque spokesman and communications director with the Council on American-Islamic Relations in Florida. The fire happened at the beginning of Eid al-Adha, one of two annual Muslim holidays, and was the third such incident at a Florida mosque this summer, according to the Council on American-Islamic Relations. Schreiber admitted to being involved in the fire, but declined to say what type of accelerant was used, according to the affidavit. Nefzi said since the fire he’s felt strong community support. Schreiber has an arrest history dating to April 2003. Many of the arrests relate to relatively minor crimes, such as shoplifting, trespassing, battery, probation violation and larceny, according to Florida Department of Law Enforcement records. 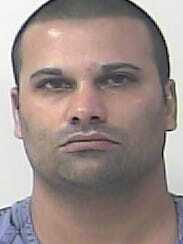 He was arrested in April 2010 by the Martin County Sheriff’s Office on a robbery with a weapon charge. All of his arrests were made by agencies in Martin and St. Lucie counties. No one answered the door Thursday morning at Schreiber’s listed address off Northwest East Torino Parkway just west of Florida’s Turnpike. A white sport utility vehicle was in the driveway of the single-story residence. Neighbors were surprised at the news of his arrest. She described the area as a family neighborhood with kids walking around. “Hopefully, they’ll get him help, if that’s what he needs, or put him away if that’s what they have to do,” Webster said. Another neighbor, Cynthia Brown, 59, said she’s seen Schreiber before, but didn’t think he was capable of the actions of which he stands accused. Nefzi said the plan is to repair the Islamic center, and said it’s still possible to worship there. When space is needed for larger gatherings, he said, worshipers can go to the nearby Muslim Friends of Florida mosque on U.S. 1.